People of Scottish heritage have always highly regarded the use of oats in their baked goods. It is evident in this mellow, whole-grain loaf that the early immigrants brought to the New World. Have liquid ingredients at 80°F and all other ingredients at room temperature. Place ingredients in pan in the order specified in your owner’s manual. Select basic cycle and medium/normal crust. Walnuts can be added 5 minutes before the end of the last kneading cycle. Check dough consistency after 5 minutes of kneading. The dough should be in a soft, tacky ball. If it is dry and stiff, add water, ½ to 1 tablespoon at a time. If it is too wet and sticky, add 1 tablespoon of flour at a time. See our Bread Machine section for more helpful tips and information. 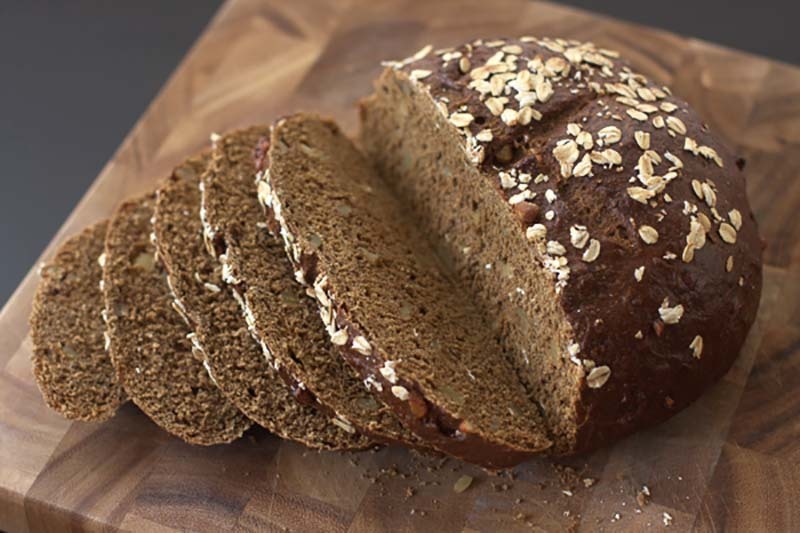 Use ingredient amounts listed for medium loaf, combine yeast, 1 cup bread flour, and other dry ingredients except whole wheat flour and walnuts in a mixing bowl. Set aside. Combine liquids in a separate microwave-safe bowl and heat to 120°-130°F. Hand-Held Mixer Method: Combine dry mixture and liquid ingredients in mixing bowl on low speed. Beat 2 to 3 minutes on medium speed. By hand, stir in whole wheat flour, walnuts, and enough of the remaining bread flour to make a firm dough. Knead on floured surface 5 to 7 minutes or until smooth and elastic. Use additional flour if necessary. Stand Mixer Method: Combine dry mixture and liquid ingredients in mixing bowl and mix with paddle 4 minutes on medium speed. Gradually add whole wheat flour, walnuts and remaining bread flour and knead with dough hook 5 to 7 minutes until smooth and elastic. Use additional flour if necessary. Food Processor Method: Put dry mixture in processing bowl with steel blade. While motor is running, add liquid ingredients. Process until mixed. Continue processing, adding whole wheat flour and remaining bread flour until dough forms a ball. Add walnuts; pulse just until mixed. Place dough in lightly oiled bowl and turn to grease top. Cover; let rise until dough tests ripe. Turn dough onto lightly floured surface; punch down to remove air bubbles. Shape into a round loaf. Place on greased cookie sheet. Cover; let rise until indentation remains after touching. Combine 1 egg and 1 tablespoon water; brush onto top of loaf. Sprinkle with oatmeal, if desired. Bake in preheated 375°F oven 30 to 40 minutes. Remove from cookie sheet; cool. Recipe featured at My Kitchen Addiction. Yes, I would suggest starting at 1/2 or 1 tsp of salt. Honey can be used 1:1 in place of the molasses. If you prefer to use white or brown sugar, use a 1:0.8 replacement ratio, plus add the difference back in with water. For example, for the medium loaf, use 3 1/4 Tbsp of white or brown sugar plus 3/4 Tbsp water to replace the 4 Tbsp molasses. Let us know how your bread turns out!